Yesterday was Canada Day and it’s just about the Fourth of July! 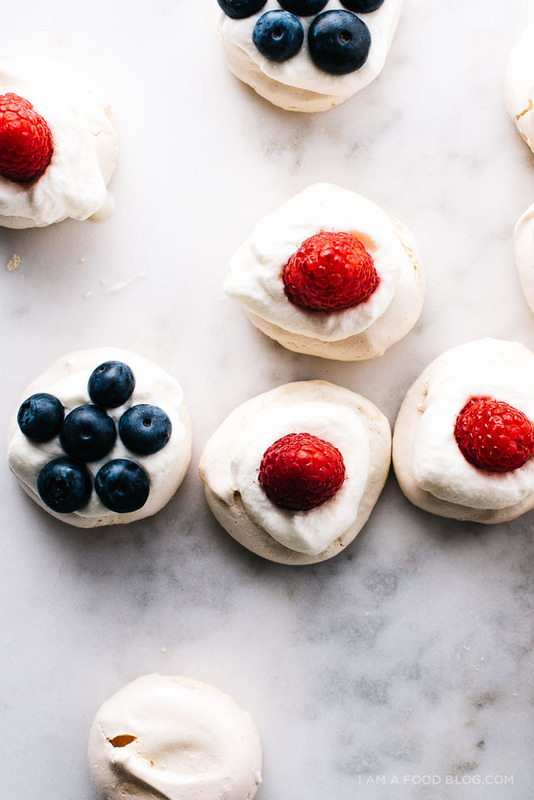 I made these mini red white and blue pavlovas as a nod to everyone celebrating. 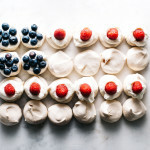 I wanted to make a Canadian flag out of mini pavlovas, but no matter how many times I rearranged, I just couldn’t figure it out. So…I went ahead and made an American flag instead. It’s kind of funny because I feel like the Fourth is such a huge holiday in the States, where as Canada Day is more of a casual kind of affair. 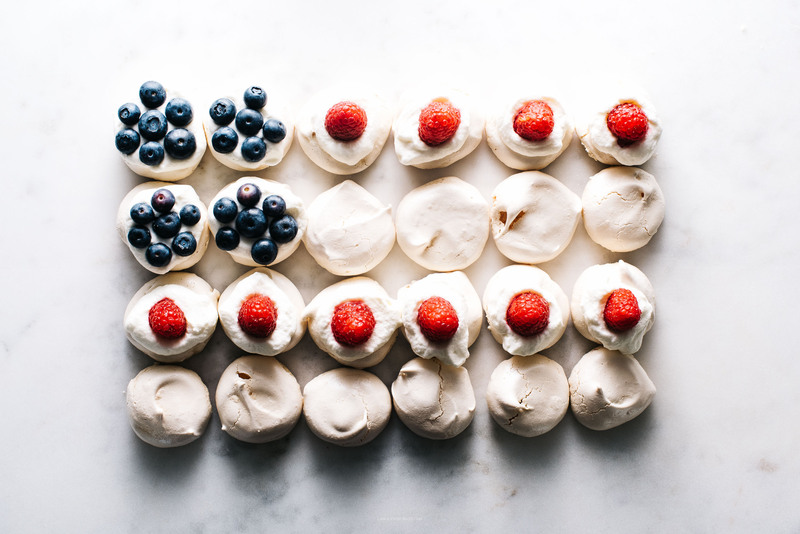 Of course everyone grills and there are red and white strawberry shortcakes, but it’s nothing like those amazing flag cakes that Americans do. 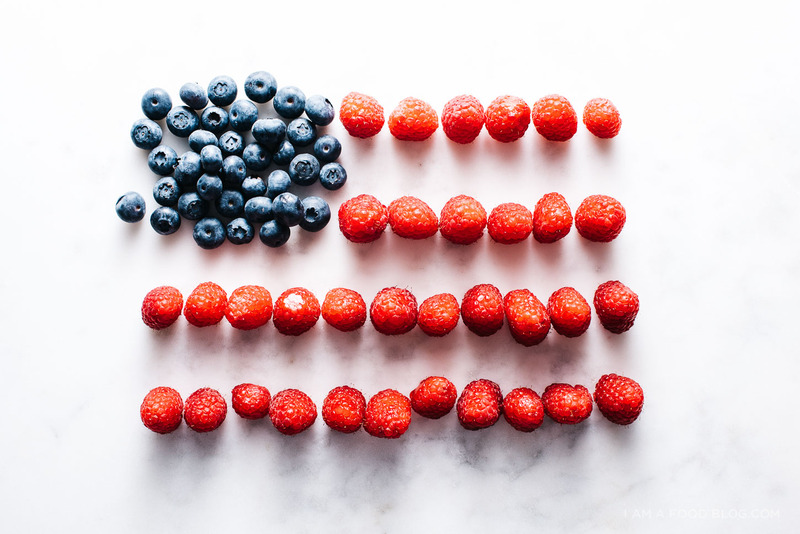 Maybe it has to do with the fact that the American flag lends itself so easily to recreation in food? After my failed Canadian flag pavlova, I settled for a raspberry flag, which was cute in and of itself. 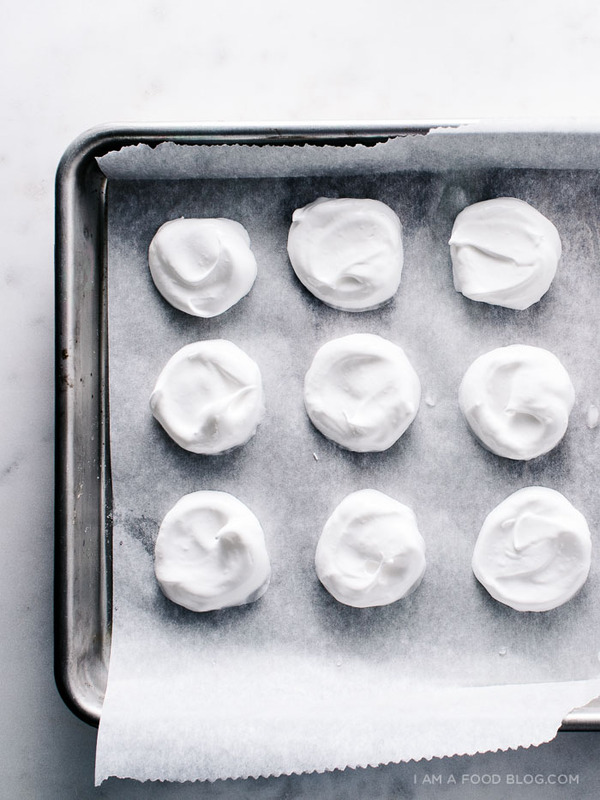 And of course these little pavlovas are cute too! 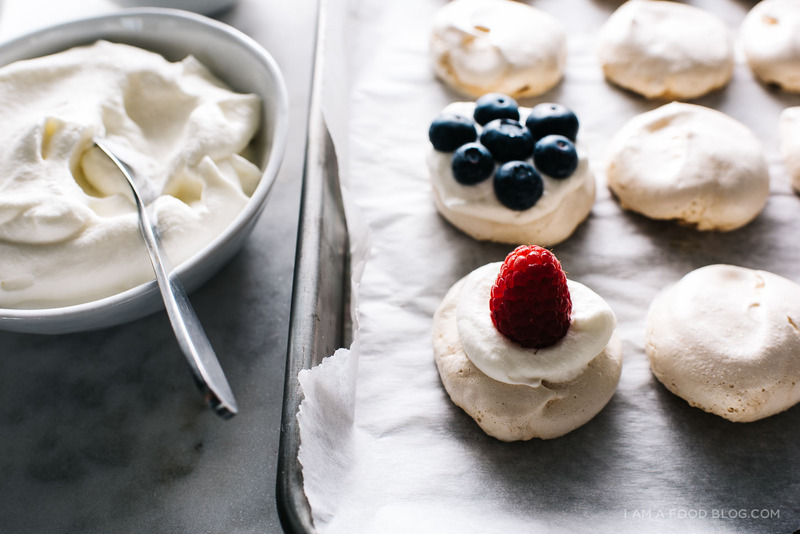 I just love pavlovas. I could eat about a million of them. They have that whole crispy marshmallow-y texture contrast thing going for them. Top them off with some softly whipped cream and fresh berries and you have yourself a surefire winner. 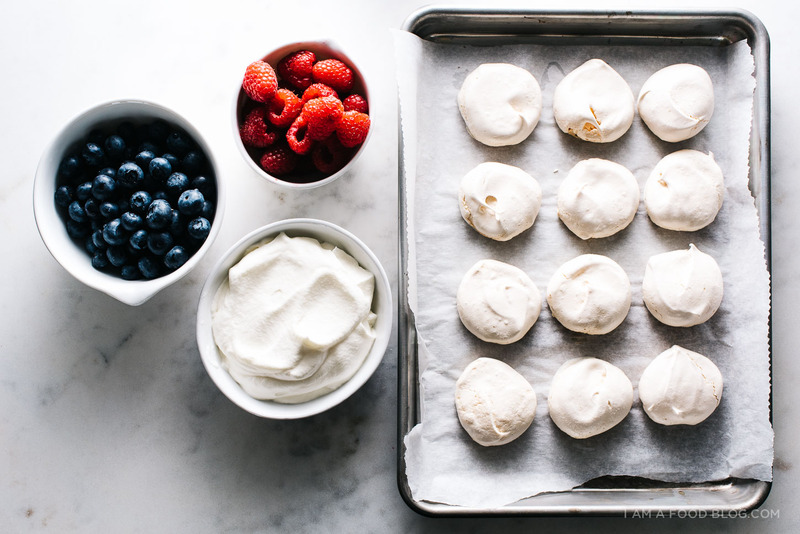 I don’t remember the first time I made meringues, but I do remember the first time I made a pavlova. It was a dark chocolate beauty topped off with a fluffy cloud of whipped cream and ruby red raspberries. I made a big one, so it cracked, but after putting the cream and berries on top, no one could tell the difference. It was so good that I decided to make it to bring to a barbecue at a friend’s place. For some reason it didn’t turn out so well the second time around so I crumbled everything up and layered it, trying to pass it off as a trifle. I got called out on it though – if I had known any better, I would have called it an Eton Mess! These little guys are not messy at all, thanks to my trick of using a mini ice cream scoop to portion them out. I just dip my scoop into a little bit of water, shake it off and scoop away. I love it because you end up with uniformly sized meringues. 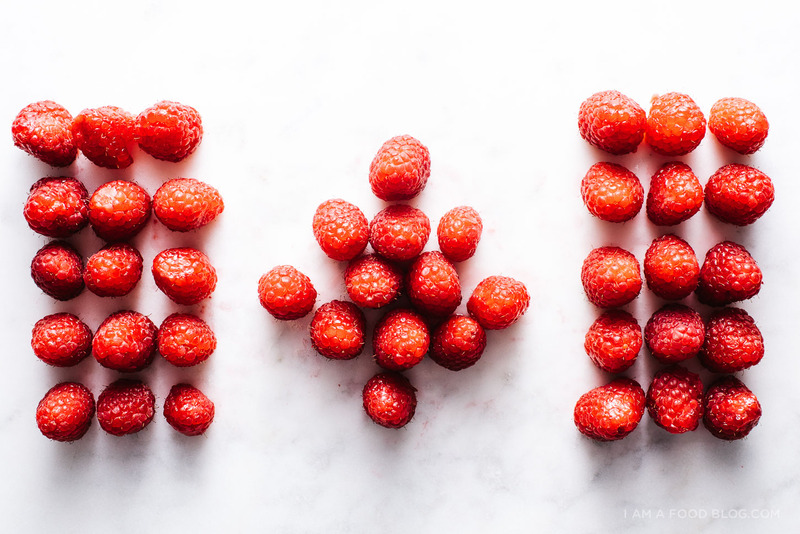 Happy Canada Day to all my lovely Canadians and Happy Fourth to our neighbors down south! 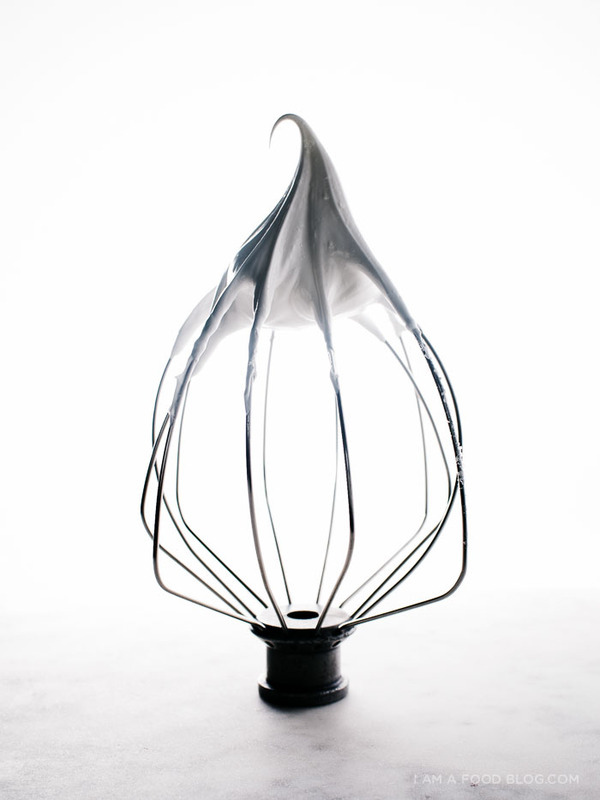 With an electric mixer, or by hand, whisk the egg whites with the salt until peaks start to form. Add the sugar in a slow stream. Whip until the eggs are shiny and stiff. Sprinkle in the cornstarch and gently fold to combine. To serve, top with softly whipped cream, raspberries and blueberries. I love eton’s mess! They’re so pretty. I love the story behind it too. These are super duper cute just like uuuu! Happy Canada Day, Steph! I saw Canadian flags everywhere in Vancouver when we visited last week. Our tour guide showed us where they’ll light the Olympic torches! 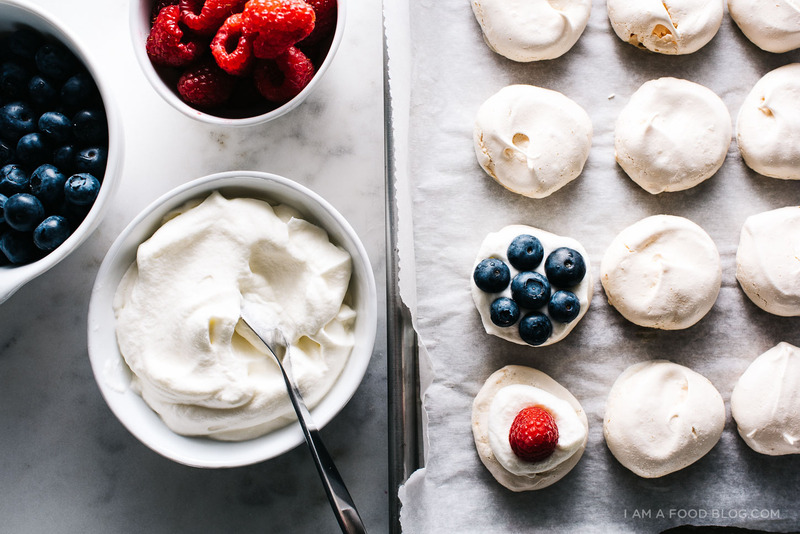 Ok, but these pavlovas though… I must admit I’ve never had one yet but they look so quick to whip up–and DELICIOUS! I don’t think I have much of an excuse now! Little cuties!! They make me so happy and I always think of you when I see mini ones now :D :D :D.
Such a cute idea. And I love how they are mini so they are easy for parties and cookouts. Thanks for sharing! These look adorable! Love mini desserts! Hi! It says to beat the egg whites with the salt, but there’s no salt listed in the ingredients! How much am I supposed to use? Just a pinch? Thank you, can’t wait to make these! !